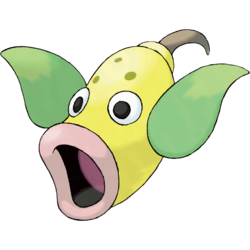 Weepinbell in game: 917 Who? Important notice! Pokemon Weepinbell is a fictional character of humans. Weepinbell has a yellow, bell-shaped body with a single green leaf on either side. It uses these razor-sharp leaves to slice up prey. It has a wide, gaping mouth with pink lips. 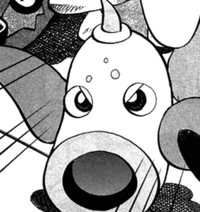 Above Weepinbell's circular eyes is a pattern of three small green spots and a small hook-shaped stem. Weepinbell camouflages itself as a plant in the forest whilst awaiting an unwary victim. When its prey draws near it sprays toxic pollen to immobilize the target before melting it with its internal acids. It oozes a neutralizing fluid that prevents these internal acids from melting its own body. Weepinbell live in forests where it hangs from tree branches by its stem to sleep. If it moves around during sleep, Weepinbell may slip and awaken to find itself on the ground. James had two separate Weepinbell, both of which evolved into Victreebel. 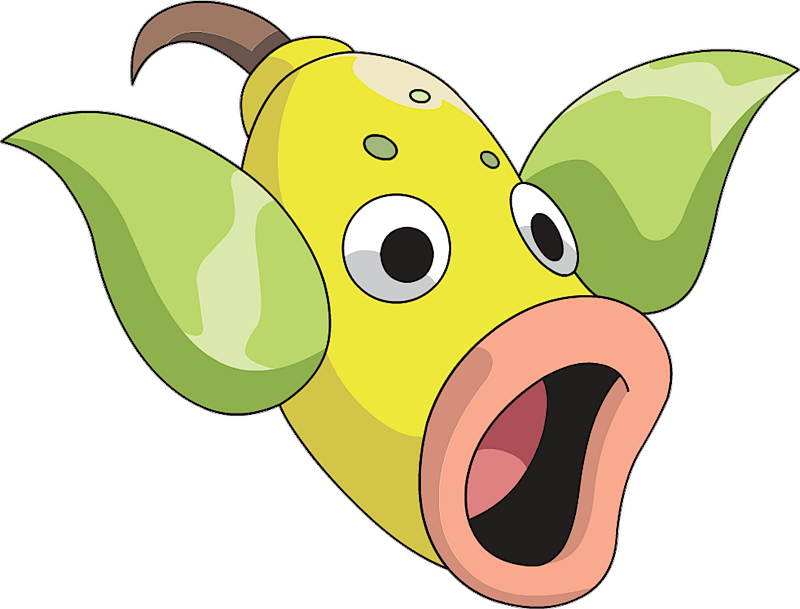 A Weepinbell was also used by Erika against Ash during the Celadon City Gym battle in Pokémon Scent-sation!. A Weepinbell appeared in The Green, Green Grass Types of Home! in a Gym Battle against Ash, under the ownership of Ramos. It easily defeated Ash's Fletchinder and Hawlucha despite being at a type disadvantage against both but lost to Ash's Frogadier despite having a type advantage. Weepinbell first appeared in The School of Hard Knocks. It was owned by Joe. 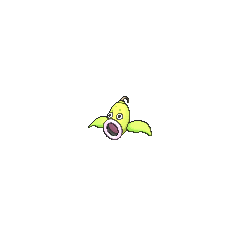 A Weepinbell appeared in Battle Aboard the St. Anne, Pokémon Fashion Flash, The Breeding Center Secret and The Power of One. A Weepinbell appeared in A Chansey Operation, where it was one of the injured Pokémon brought to the clinic. 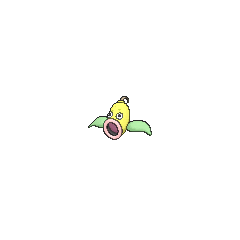 A differently patterned Weepinbell appeared in Poké Ball Peril. A Weepinbell was used in Bonitaville Beauty Contest in Beauty and the Breeder. A Weepinbell belonging to an unnamed competitor appeared in The Grass Route competing in the Grass Tournament. 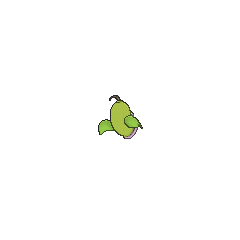 Two Weepinbell were among the Pokémon seen at Wings Alexander's barn in Throwing in the Noctowl. A Weepinbell was one of the Pokémon seen in a forest outside the Ice Path in EP250. A Weepinbell was used by one of the students of the Pokémon Trainer's School in Gonna Rule The School!. A Weepinbell appeared in All Dressed Up With Somewhere To Go! during the Pokémon Dress-Up Contest. A Weepinbell appeared in a flashback/fantasy in The Forest Champion!. Multiple Weepinbell appeared in Gold's imagination when he asked on of the monks if the third floor had Weepinbell there in Bellsprout Rout. In The Last Battle XIII a Weepinbell was one of the Pokémon sent to help the fight in Ilex Forest. Sebastian, Platinum's resident butler, has a Weepinbell that he uses to drive burglars out of the Berlitz mansion. However, when Diamond accidentally sneaked in thinking that he walked into a large park, all the Pokémon accomplished was getting his clothes wet, though it proved to be an adept battler. Making an L-shaped match deals more damage than usual.